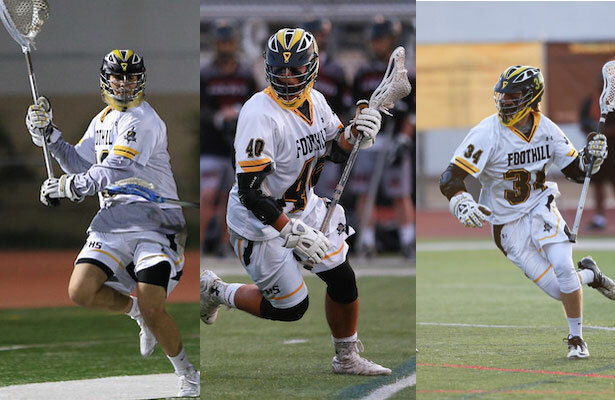 Foothill High School head coach Jon Fox announced that seniors Ryan Blank, Matt Harris, and Kevin Kodzis have been selected by their Knights teammates as the captains for the 2015-16 academic year. Fox said “I expect all our seniors to be heavily invested in leadership roles and guiding the team, however three individuals have been selected to focus on putting the team first, and be responsible for making their teammates better. These three have shown continued interest in the team’s well being, they lead by example first, and are dedicated to passing on the Knights tradition and work ethics down to the younger classes. These three have made an impact for the program since arriving at Foothill, and I’m very excited that the team has chosen them as Captains.